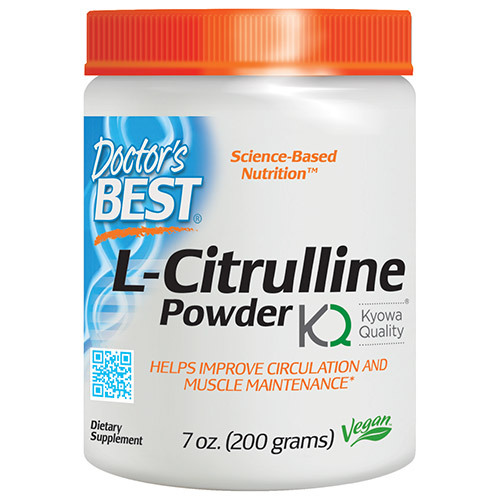 L-Citrulline is an amino acid that plays an important role in nitric oxide metabolism and regulation. In the body, L-Citrulline is converted to L-Arginine to support L-Arginine and nitric oxide levels. Increased production of nitric oxide promotes vascular dilation, which may help to improve oxygen and blood circulation throughout the body. It is also thought that L-Citrulline raises plasma L-Arginine, thereby allowing higher protein synthesis and protein content in muscle during exercise. Take 1 scoop daily with 8 oz. of water or beverage of your choice, before workouts, or as recommended by a nutritionally-informed physician. Do not use in conjunction with vasodilating medications. Below are reviews of L-Citrulline Powder - Kyowa Quality - 200g by bodykind customers. If you have tried this product we'd love to hear what you think so please leave a review. It definitely works for me,I don't have almost any pulsations any more.